The little region of Umbria has a medieval character, with well-preserved towns like the picturesque hilltop town Assisi, made famous by its most beloved son, St. Francis. The hill towns are noted for their handmade ceramics. Castles and fortresses from ages past are found here and there, also among its rolling hills. Its regional capital Perugia is known for its perfectly preserved cobblestone streets, aristocratic palaces, and its University. Perugia's piazza, with its medieval fountain, is believed to be one of the most attractive in Italy. 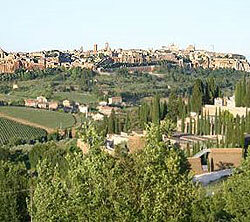 Located in Central Italy, Umbria is bordered by Tuscany to the west, the Marche to the east and Lazio to the south. Though considerably less popular its close neighbors, this fertile land has a lovely landscape. The source of the great and historic Tiber River of Rome is in Umbria: a small stream halfway up Mount Fumaiolo that gains in size and strength as it travels down the slopes.